This IBM Redbooks publication considers an enterprise and describes some of the procedures and documentation that need to be developed to secure WebSphere MQ on the z/OS (zSeries), OS/400 (iSeries), IBM AIX (pSeries) and Windows 2000 (xSeries) platforms. 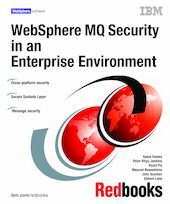 This book also documents the before and after configurations needed to take advantage of the recent functional improvements to WebSphere MQ, such as the Secure Sockets Layer (SSL). Security is a complex subject. The first part of this book is intended to help the reader understand it. The second part lays out a business case scenario where the technology is implemented to secure WebSphere MQ. - Cross-platform security, ascertaining the responsibility of identification and authentication. - Security issues when using WebSphere MQ over the Internet. - Securing of messages, taking advantage of the functional improvements to WebSphere MQ such as PKI and SSL. - Maintenance of message integrity by means of authentication and encryption. - Use of technologies external to WebSphere MQ, such as PKI, DCE, and RACF to solve the security concerns. The appendixes provide additional information, scripts, sample code and JCL related to the chapters in the book.